After introductions of all the attending members were completed, Technical Session 1, Efficient Pasture Systems Design for Natural Features and Management Challenges commenced at 8:30 AM February 7. Donald Wild, owner and operator of Wild Acres Family Farm, and former grazing lands specialist with the Natural Resources Conservation Service, gave a presentation entitled Efficient Pasture Systems Design on Irregular Topography. 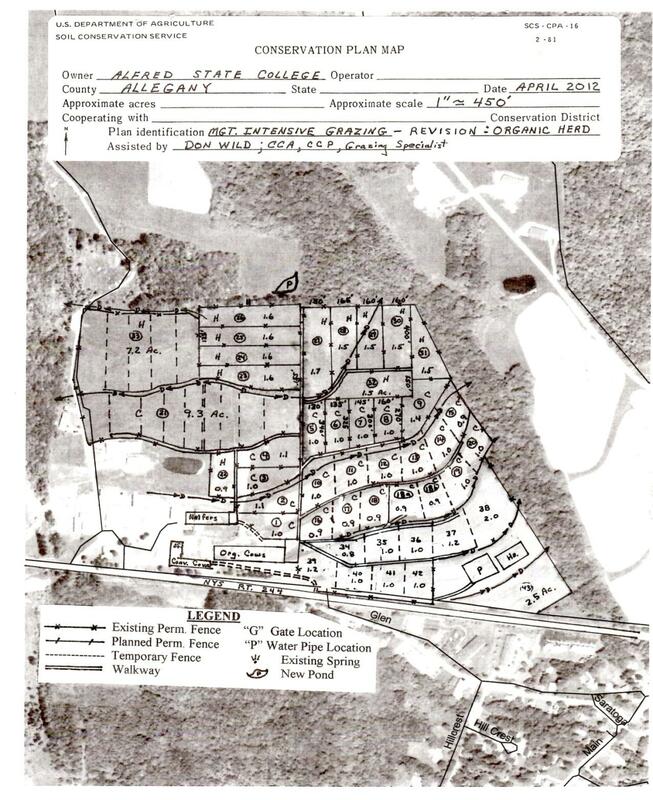 Don used the Alfred State University dairy farm as example of laying out a pasture paddock system on irregular topography. A formerly terraced cropfield added to the challenge as diversion terraces snaked their way across the hill slope. The dairy barn was at the bottom of the hill so the dairy cows needed to walk upslope a ways before being diverted off to one side or the other to traverse the terrace ridge tops now used as laneways to paddocks arranged side by side above and below the terraces. The terrace ridges were regraded to create a wider and flatter top to improve walkability. Where livestock enter uphill paddocks a graded, paved channel crossing is installed. Lateral water lines also ran beside the terraces under a paddock fence to provide water at each paddock. Others use terrace channels as walkways. Since runoff is less on pastures, little channel erosion occurs. Larger pasture divisions are fenced with permanent fencing. These larger divisions can be harvested for hay when forage is in excess of what is needed for grazing such as at the spring flush of growth. The larger pasture divisions are subdivided into paddocks with temporary fencing such as with single-strand electrified wire, polywire or tape when providing a forage allowance for the grazing herd. These temporary fences are in place only long enough to allocate forage paddock by paddock. This allows the larger pasture subdivision to be harvested for conserved forage barrier-free. Water lines can either be buried or lain across the ground near a fenceline where they are not susceptible to being stepped on or driven over by farm equipment. Amish farmers prefer to have their PVC pipelines buried to avoid damage to them by steel-shod draft horses and steel wheels used to pull and convey their farm machinery. This is particularly important at gateways and laneways crossings. The advantage of laying PVC pipe on the ground surface is the ability to move them easily if there is a need to change the configuration of the pipe system. In freezing weather, the pipes must be drained to avoid ice expansion rupturing the pipes. For cost-share assistance with pipelines, the need to bury pipelines varies from state to state. In rock outcrop and stony soils, burying pipelines is challenging and costly. Grazing plan success is predicated on: If we have the correct attitude and goals are established, then we need an adequate supply of forage dry matter to support the livestock on the system. The “Human Part” of a Grazing System requires assessing what needs to be accomplished as the prospective operator of the system sees it. How intense will a system be operated? Maximize forage dry matter (DM) intake. Pasture forage as a supplement to a total mixed ration (TMR). Pasture used as an exercise lot. Other situational and topographic issues can arise from farm to farm. For instance flat fields with a series of spaced parallel drainage ditches require a series of paddocks be arranged to lie between two ditches to avoid having to cross the ditches at several points. These paddocks are served by a laneway running alongside the top edge of one ditch, or the paddocks can be simply be forward and back fenced progressively across the field between two ditches using electrified wire or tape that connects up to the fences running along the top of each ditch bank. Which alternative to use depends mostly on operator preference and to some extent the length of field between the two ditches and the number of paddocks needed to graze-off the area. Another situation where there is an intervening woodlot between pastures, it is best to create a laneway through the woodlot to avoid damaging trees by treading damage from wandering livestock and be certain the livestock find their way to the next pasture. Where streams cut through pastures, a graded and paved stream crossing may be necessary so that the stream and its banks are protected from treading damage and the livestock can safely get to grass on the other side of the stream. Dairy cattle access to a steep hill pasture without using a walkway can be accommodated by placing drinking water at the top of the hill. This motivates them to climb up the slope while grazing to get water if their access to the hill is from the bottom. This paddock often is used less frequently since grass production is often less here than on flatter paddocks and renders a laneway impractical. 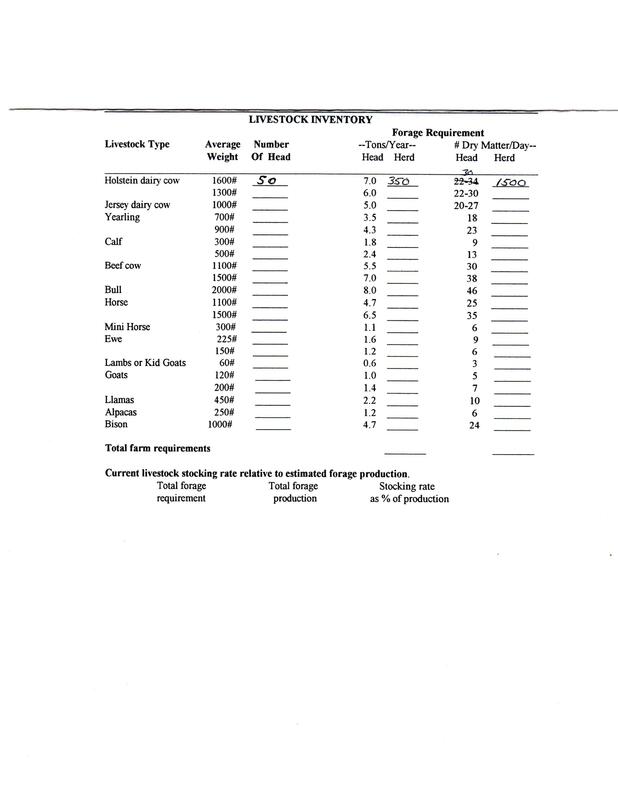 Don then demonstrated a use of a one page worksheet to determine how much forage is required by the livestock being raised on a daily and yearly basis and how much pastureland is needed to feed the herd or flock throughout the grazing system. This one-pager gives an easy estimate of paddock size and total acres needed for a herd or flock of livestock either currently on the farm or planned for the future based on yield potential of the soils in the pastures given the climate and use of fertilizers and lime to optimize soil fertility. Soil limitations of excess water or droughtiness might require water management by drainage or irrigation, respectively. Editor’s Note: Number of Acres needed in each paddock, Spring calculation assumes 7 rotation cycles during the pasture season. One seventh (0.143) of 5000 lbs./acre of yearly forage equals 715 lbs./acre. This number is divided into the 1500 lbs. of forage demand by the herd/flock and yields a paddock size of 2.1 acres. The / between the 5000 lbs. column and the % forage available should be an X (multiply). It may be better to have a thousand pounds of forage on-offer to a dairy herd and reduce grazing cycles to 5. This would be less restrictive to intake, but would also depend on amount of TMR being fed to the herd. 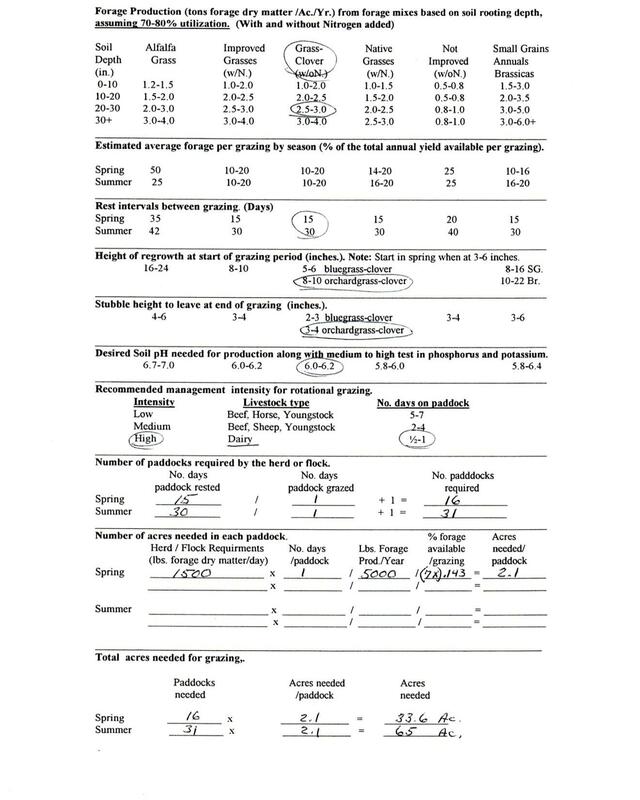 Half day grazing periods can be calculated on this sheet, substitute the 1 at number of days paddock grazed column with a 0.5. It doubles paddock numbers but reduces paddock size in half. If soil depth varies across the farm, a sheet to estimate yield for each soil depth acreage is a good idea.